I started training for the City to Surf today, with a 6km run. I felt slow and fat after two weeks of eating and not really exercising, but it was good to get out and stretch my legs. I will be aiming for 2-3 runs a week for the next 12 weeks, but broadly following the ever-increasing distances. I’ve run the City to Surf twice before, and don’t remember it being that hard, but both times it was 12km rather than 14km, so it will be a bit more of a challenge this time around. I blogged in December last year about slowly getting there with my weight loss and exercise goals. At that point I had come to a bit of a stand-still on the weight loss front, which was perfectly acceptable to me. Since then, I have very, very slowly been losing some more. In December I was at 82kg, now I’m hovering around 77kg. Although I have to say that I randomly gain/lose up to a kilogram between weigh-ins sometimes. So weird! I’m really happy with the size I am now. Somewhere under the flab and extra skin from all the years of yo-yo-ing, I now have abs! For me it’s not about how I look, it’s about functionally what I can do with my body. And at this size I can run with ease, my yoga has improved, I can do more weight-bearing exercises like push-ups, and my back is well-and-truly on the mend. I was listening to a podcast interview with Jodie Foster today, and she talked about downhill skiing. She made the point that when she’s skiing, she needs to be fully concentrated, fully in the moment – because if she let her mind drift to the minutiae of everyday life, she might end up crashing into a tree. It made me think about the sport I play and why I like it. It has to be said, I’m not good at sport. I’m fairly uncoordinated, and I lack that passionate desire to win. But Jodie is right – what I love about playing sport is that when I’m out there, all I’m thinking about is the puck, my position, the other players. There is no room to let my mind wander or worry about what happened before the game. It’s one of the few times that I’m not thinking about a million things. I’m just enjoying what I’m doing right then. It was Stephen’s idea … I would have been just as happy staying home for the day. Stephen, Bronwen and I walked the Bridle Path this afternoon – to the top of the Summit Rd from the Gondola carpark and back again. When I was a kid, and when my kids were young, the Bridle Path was like a rite of passage – most Cantabrian kids have walked from the Christchurch to the Lyttleton side at some point in their life. I managed to avoid it until now. To be honest, I thought it would be harder. It’s steep, but not to the point that it slows you down too much, and it wasn’t nearly as far as I thought either. It took us about 30 minutes to get to the top (going at the pace of the slowest Frayle). The ease at which I was able to wander to the top is a testament to the hard work I have put in at the gym in the past year. I really love that I have a pretty good level of functional fitness that allows me to do these kinds of things easily. Sometimes it boggles my mind – I’ve come a long way from the person I was. It’s hard to me (and others) to imagine a time that any vigorous activity was beyond me, but that’s who I was. It hasn’t been easy – getting fit and staying fit takes a lot of time, energy, perseverance. But when I’m standing at the top of the Summit Road, looking down at the 1.5km uphill track I just climbed, it feels very much worth the effort. Since I retired from playing derby in December last year, I’ve lost about 10kgs and 3-4 inches of size around my hips and waist. I’ve struggled with my weight my whole adult life. I made some major life changes in the mid- ’00s that led to a 45kg weight-loss, and a new-found appreciation for exercise. It was completely transformational, not just on my body, but in my outlook on life – my belief in myself and what I was capable of. 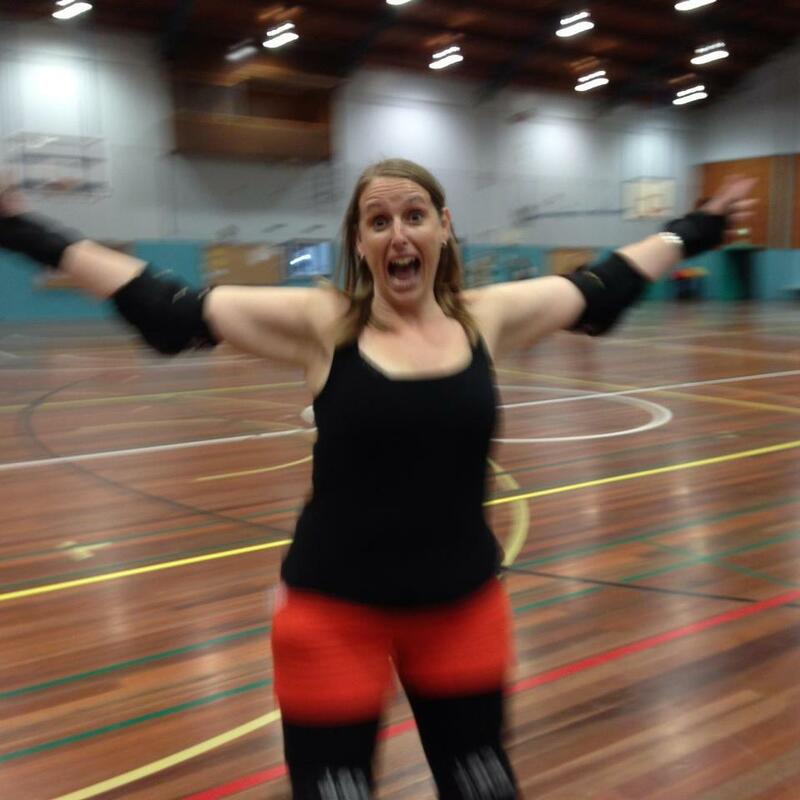 The combination of earthquakes disrupting my regular exercise routine, a back injury that just won’t go away, and starting roller derby has seen my weight creep up a bit in the past couple of years. I accepted it, but wasn’t happy about it. The answer was simple, but it involved making a tough choice. So I gave up playing roller derby. It helped my back pain and freed up time so I could go back to the gym every day. And the result was fairly immediate. My weight and size has been steadily tracking downward and is now back to a point that I’m happy with. It’s funny that hours of roller derby training and other skating did not help me lose weight. I put this down to the fact that I just can’t work at the intensity my body needs to burn fuel when I’m skating. It has to be said that I’m a pretty average skater. Accepting this fact really helped me make the decision to quit. I absolutely love my new role as a roller derby referee. It’s so much more technically interesting – less about the skating and more about how the game is played. And I still get to skate around and admire my favourite skaters up close. At the moment I’m doing a combination of RPM (interval training on a bike) and Balance (combines tai chi, yoga and Pilates) classes at Les Mills. I love RPM! The first time I did it years ago, I almost died – intense cardio, and it killed my legs. It took me more than a week to be able to walk properly again! Roller derby training must have built the right muscles, because it’s been much easier this time round. It’s just the right amount of cardio and strength training for me. I still really really (really really really) miss running. My back issues make it too painful, but I’m hopefully that I will be able to run again eventually. With a bit less weight on, and regular stretching and massage, it’s getting better. In the meantime I’m cheering Stephen on from the sidelines (I’m a bit envious, but he’s doing amazing!). I’m looking forward to giving it another go in spring. Weight loss is easy and hard. Easy because it’s a simple formula – energy in / energy out. Put less in and put more out and you will lose weight, guaranteed. The hard part is the commitment to making it happen. For more than 10 years, I’ve had to make a huge effort to manage energy in / energy out. It has become my life’s work, and it gets hard when life gets busy. I have to make eating well and exercising a priority – sometimes above other things I love. I do it because I know what happens if I don’t. I never want to go back. I’m going to my first derby bootcamp this weekend in Blenheim. It’s going to be awesome, and exhausting by the looks of things! I weighed myself at the gym today, it made me remember once again why measuring myself this way is a waste of time. When I first started losing weight in 2003, I was going to the gym every second day, and I weighed myself once a week. It was a good way of keeping track of the slowly diminishing number and gave me something to spur me on. Sometimes I’d gain weight and it would give me a fright, but in general, the trend was downward. Once I reached 83 kilos, the weight-loss stopped. I’d lost 45 kilos in about two years, so I was happy with this. Losing more weight would have involved serious dieting, and I didn’t think that was wise. Since then, I have continued to eat sensibly and exercise regularly, and my weight has fluctuated very little. There have only been two only exceptions to this, in 2008-2009 and 2011. In 2008-2009 I was very ill, culminating in the removal of my gall bladder. Both before and after surgery, I had trouble eating and dropped to about 78 kilos. The weight gradually climbed and settled again at 83 kilos once I got better. Isn’t that a funny thing? Last year after the 22/02 earthquake, the huge changes we all went through altered my diet and exercise routine again. My weight jumped to around 87 kilos. I went back to the gym, refocused on what I was eating and once again I returned to 83 kilos. So here’s my point …. today I weighed in at 84.5 kilos. In the past couple of months I’ve been doing a lot of running, and I know that I have changed my shape – I have more muscle and less fat. I’ve lost about half a dress size in the past two months. Not a lot, but just enough for me to notice that my clothes are looser. So I’ve gained weight and lost size. So while the scales might be telling a sort of truth, it’s not a truth I want to listen to. When I asked him if it was okay to do exercise after he’d been cracking my back, he said, ‘yes, no problem’. He looked a little horrified when I responded, ‘Great, because I have an ice hockey game tonight and I don’t want to miss it’. I tried to explain that non-checking hockey is actually much less hard on the body than a lot of other sports, but I sensed his skepticism. Then the following session I asked if it would be okay to go for a run. He said ‘I could say go for a slow jog, but you won’t be able to, will you?’. Ummm, no. I have two speeds, GO and STOP. And I only really use the second one when I crash. Anyway, the update. After the first session, the pain shifted from my right hip to my left hip. Weird, but apparently normal. After the second session it shifted from my hip to the middle of my back. And it was OMFG painful. Ouchie ouch ouch! Just as it was feeling better I had the third session. And just the same as the second session, I had one day of no pain followed by LOTS of pain in my back. All normal apparently. Guy seems to think the pain should be gone after two more sessions. And I think I might just believe him. It does feel different. It’s painful, but much more specific and intense rather than feeling like my whole body is knackered. So that’s progress! Oh and also, Guy totally fixed my shoulders. They were both hurting, one from hockey and the other from OOS, and now they are completely pain free. Guy says those injuries were easy to clear up because they were new. The back pain is from a 20-year-old untreated injury and my body has been compensating all this time. So he has to work backwards through all the compensations to the crux of the issue. Stephen thinks this is just code for “you’ll need lots of sessions at $50 each” but I think it sounds plausible. I’ve been suffering with a variety of aches and pains lately. I’ve had migraines off and on for the past three weeks. They’ve left me feeling tired and washed out. Added to this is my regular lower back pain, which has flared up for reasons unknown. A new problem is hip pain. When it first started a few months ago, I just figured I wasn’t stretching adequately after running, but it’s become progressively worse to the point where I’ve had to stop running altogether – since it hurts the most after I run. This makes me so sad. I love to run. It’s great exercise – good cardio, it gets me outside, and it clears my head. I’m really missing it. I suspect that the back and hip pain, the migraines, and the shoulder and arm pain I’ve had for ages from OOS are all related. So I’ve booked in to see a chiropractor, following advice from a trusted friend. My basic assumption about this kind of practice is that it costs a lot of money for not much result – I’m a skeptic. So we shall see if it gets results. At this point I’m willing to give almost anything a try. I don’t know how it happened…it snuck up on me. I’ve become…what? Sporty is not quite to right word. What is the opposite of a couch potato? That’s me. In 2002 I was in Paris and at an all-time weight high (125kgs). It was my 30th birthday and I was realising a dream. We were at the Arc de Triomphe and I wanted to climb the 100-or-so steps to the top to see the view of Paris. But I knew I’d not make it. I was so very unfit that it made the trip uncomfortable at times – I couldn’t do all the things I wanted to. I came home determined to change my life. I was scared about the idea of losing weight (having had trouble with losing too much too soon in the past) so instead I focussed on getting fit. I joined the gym at work and started going. At first it was pretty basic stuff. Walking on a treadmill, rowing machine, the dreaded crosstrainer. Eventually I got fit enough to try aerobics classes. My first step class almost killed me. Not because I was puffing but because I’m so uncoordinated that I spent the hour tripping over my step and flailing about. I decided to stick with the basics for a while longer. Walking became running, and I found myself lacing my sneakers for early morning road running, and actually enjoying it. I didn’t really lose much weight this way. In fact I think I gained weight at first. That was scary (and yes I know muscle weighs more than fat blah blah, it still freaked me out). And so slowly I became fitter. I was never going to be super fit because I weighed in excess of 100kgs, but I was better. Healthier and happier. And eventually I did lose more weight, but that’s another story. And now I seem to have become some kind of sporty spice. I run, I bike, I ice skate, I dance, and now I rollerblade. I’m thinking I’d like to join an indoor soccer team. How did this happen? I love it, it makes me happy and it means I can keep up with super-speedy Wyatt, but I still find it incongruous with my self-image (a lazy fatty). I guess my insides will catch up with my outsides eventually.